Disclaimer for anyone who may stumble across this post: this content is not based on any actual knowledge about homelessness or experience working / participating in social services; this is just me meandering as usual. I hope I'm not being offensive to anyone, but this guy is my favourite homeless person in Ueno. 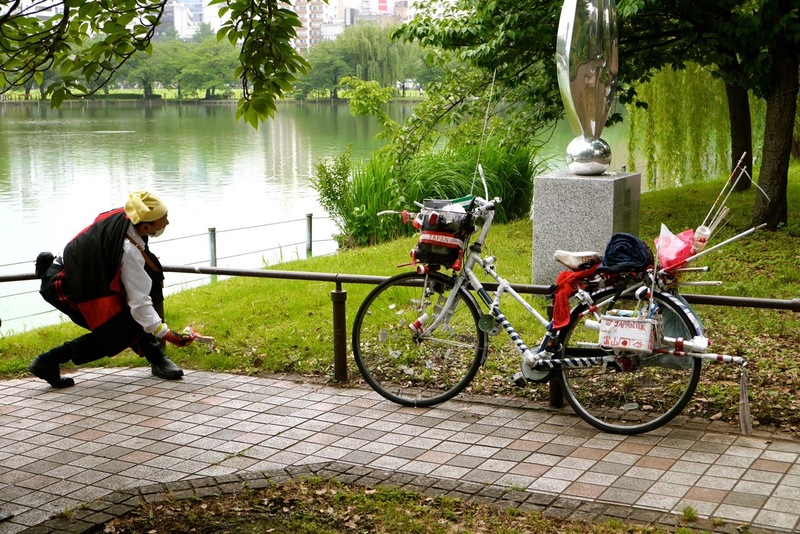 I see him several times per week since I usually ride through Ueno Park during my commute to and from work. He's always doing something interesting, he's got an really kool bicycle and is often wearing something ostentatious. In this photo he's performing some sort of ritualistic dance with a discarded potato chip bag. Earlier this week I saw him chanting something while furiously ripping weeds and grass out of the ground and throwing them to and fro, stopping periodically to point at passersby while striking pseudo martial arts poses. The poor guy is probably in need of mental health care, but sadly he's not likely to get it in our society over here. I like this guy! Can I say that? I thought about asking his permission to take a photo, but I'm reluctant to do that because I'm not sure he would welcome it, and his actions often border on the frantic and agitated. Homelessness in Tokyo is really a mystery to me because it's so very different from what I'm accustomed to in the U.S. There was really no such thing as homelessness until after the bubble economy broke in the 1990s and unemployment became widespread. Recent Japan Census estimates say that there are probably at least 5,000 homeless people living in Tokyo. Many of Tokyo's homeless live seemingly undisturbed in make-shift camps in out-of-the-way corners of public parks, and I've seen many, many homeless folks start their day by waking up early and sweeping and/or tidying up the public spaces around them. Taking shelter under other urban shelters like bridges and underground cross-walks does not seem to be discouraged, but obviously I can't know the true situation for sure. I can't help but wonder how support systems work here. The vast majority of homeless people in Tokyo have wheeled push-carts and blue plastic-vinyl tarps that all look exactly the same, as if they were issued to them from somewhere. I've also observed that local businesses tend to leave their discarded cardboard cartons out for homeless people to use, as opposed to cutting them up and stuffing them into a trash compactor like they do in the states. For some reason I have never once been asked for change or a handout of any kind, nor have I seen people around me being asked, even in areas with a large homeless population. Here is a BBC page that shows a handful of photos documenting homeless in Osaka, a city that was particularly hard-hit by the economic downturn of two decades ago. I can't help the feeling that this post is probably making someone somewhere angry or offended. I sincerely hope not, but I also know that these days good intentions carry no value if one's words are seen to be perpetuating stereotypes or oppression, whether the author is aware of it or not. If anyone is actually informed on the topic of homelessness in Tokyo, I'd love some comments!